One of the main attributes of back country hiking that intrigues me the most is visiting places that very few people will ever see with their own eyes. There is something special about being one of just a handful of people to have personally witnessed some of the more magical parts of this planet. I had originally set out to do this hike on my own, but considering how remote the area is I had second thoughts. I invited some friends to come along and also found another group (led by photographer Jabon Eagar) planning the exact same hike and contacted them to see if we could hike together. I began planning my trip and convinced several people to come along, but that fell through as, one-by-one, they all cancelled. The same thing happened with Jabon’s group and we both decided to push the trip off. I wouldn’t let this one go, so earlier this year my fiance and I joined up with Jabon to hike Pueblo Canyon. Pueblo Canyon is a very remote, obscure, rarely used trail on the east side of the Sierra Anchas (Spanish, “Broad Range”). The Sierra Ancha Wilderness lies about 100 miles east of the Phoenix Metro area and north of Globe. It’s 32 square miles are some of the most rugged and inaccessible wilderness in Arizona. 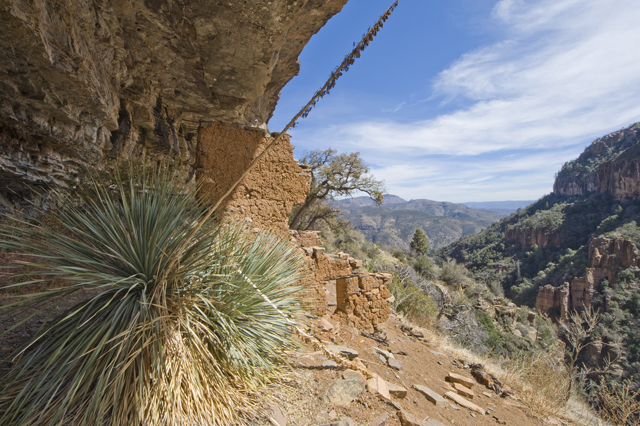 Established in 1933 as a “primitive area” and later absorbed into Tonto National Forest, it was originally shared by several Native American Tribes but was last occupied by the Salado Culture over 700 years ago. It’s said that the remains of Salado cliff dwellings and other signs of habitation can be found in nearly every south facing canyon wall in this area. Pueblo Canyon itself has 3 main sites and rumors of more further along the cliff. Many of the main Ruins in this area, including Pueblo Canyon were documented in 1934 by Dr. Emil W. Haury. As part of the Gila Pueblo Project Expeditions, Dr. Huary explored the area from 1930 to 1934 led by local Rancher Dewey Peterson. Peterson owned and operated a ranch at Aztec Peak, just above the canyons where the ruins were found. Due to how remote this hike is, we had to set out very early in the morning to be able to hit the trail before too late in the day. We met up with Jabon and his group around 6am in Mesa and then set out on the 3+ hour drive to the trail head. The drive takes you through some of the most scenic territory in Eastern Arizona. Beautiful rock formations, canyons and cliffs line the road north of Globe. The trailhead is a little over 23 miles down Cherry Creek Road. A dirt road the whole way, Cherry Creek Road is partially maintained and well traveled, but soon becomes a very primitive jeep trail requiring a 4-wheel drive vehicle. It also crosses Cherry Creek at times and can be hazardous if the creek is up. We made it to the trailhead without incident only to find that we now had a flat tire, but decided to deal with that upon our return and headed up the trail. The hike starts where an old mining road intersects Cherry Creek Road. The road was built in 1954 to service the Big Buck Uranium Mine found near the first set of ruins. Hiking this first section gets your blood pumping early as it steadily climbs toward the canyon interior and into the Sierra Ancha Wilderness area. About a half mile or so in, the trail splits. It was a little tricky to figure out exactly where this split was, continuing to the south would take you to Cold Spring Canyon (there are ruins there also) and taking the trail west would lead you to Pueblo Canyon. We continued heading toward Pueblo Canyon reaching a landing of sorts that opens up to the Cherry Creek Valley and offers some amazing views to the east. The trail is very overgrown from here until reaching the ledge at the base of the cliffs. We found ourselves trudging through overgrown Manzanita and Scrub Oak making route finding difficult at times. We ascended above the slope and leveled out at a prominent ledge that sits at the base of the massive sheer cliffs that rise above the canyon. This is where all the action is! From this point we were at the base of the south canyon wall and could look across the narrow canyon to the north wall and make out the cliff dwellings we were after. Hiking was easier here, though the vegetation had changed and we were now climbing around Prickly Pear, Yucca and Desert Spoon. The first set of ruins is very close to the mine site and, therefore, the most disturbed. Tailings from the mine were dumped in the ruin site and eventually the ruin itself was damaged beyond recognition. The mine is fairly nondescript and is not very deep. It was still a good place to stop, set up some photographs and have a snack. The trail heads further west from here in to the heart of the canyon where a thin, graceful waterfall plunges some 200ft into a small pool. The ledge trail leads you behind the ribbon falls along some slick, algae covered rock. We took some time here for photos and carefully navigated the slippery path behind the waterfall to the north wall of the canyon. After a short walk, building with anticipation, you stumble across the first major set of ruins. 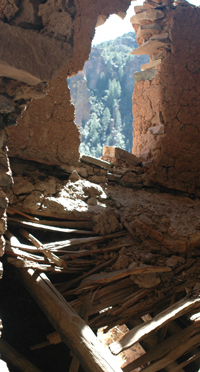 It is a wonder to see each one of the cliff dwellings still left standing on this side of the canyon. Some the wood and mud roof structures are still partially intact. Wood beams still rest in place, lodged in the stacked stone walls. Many of the mud and stone walls still have a primitive stucco finish (mud plaster). 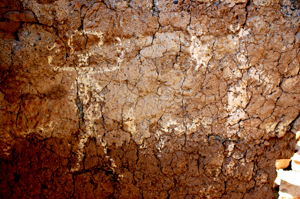 In some places, you can still see the coloring and pictographs that originally decorated the stucco walls. The back wall of the structures is the cliff face itself. 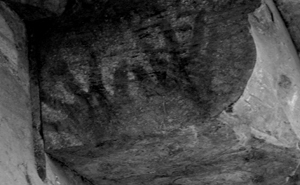 Parts of the dwellings are multi-story and rock art high on the cliff is still visible, if only slightly. Some of the rock art on the walls is unlike any I’ve seen in Arizona. Vibrant pictographs and hand prints in bold reds and whites decorate the cliff. Climbing in and around the ruins, careful not to disturb or damage any part of them, we explored the structures for quite some time. We ate our lunch sitting among the stone walls, looking out over the canyon floor 1,000 feet below us and discussing the history of the Salado Culture. The return hike seemed to pass quickly. We ran into one section where we seemed to lose the trail, but a little bush-whacking put us on course and we were soon back at the truck and Jabon quickly went to work switching out the flat. The ride home seemed very, very long and I found myself wishing we had planned an overnight so that we had ample time to explore the adjacent canyons and see more of what the area had to offer. I will go back some day, there is so much more to see. I just need to find a few adventurous volunteers brave enough to venture into the wilderness with me. Click here for more of Jabon’s photos from this hike. To check out more of Jabon’s beautiful photographs visit his website.